Roger Federer (1) -- Favored to win record-extending ninth Wimbledon title before turning 37 on Aug. 8. Northern California connection: Made NorCal debut in March, beating Jack Sock in exhibition before sellout crowd of 17,496 at SAP Arena in San Jose. Rafael Nadal (2) -- Won Wimbledon in 2008 and 2010 but hasn't survived fourth round there since 2011. NorCal connection: None. Marin Cilic (3) -- U.S. Open champion in 2014 has lost to Federer in two of past four Grand Slam finals, including 6-3, 6-1, 6-4 last year at Wimbledon while hobbled by foot blister. NorCal connection: None. Novak Djokovic (12) -- Three-time Wimbledon champion (2011, 2014, 2015) held match point in loss to Cilic in Queen's Club (London) final last Sunday as he rebounds from right elbow problems. NorCal connection: None. Milos Raonic (13) -- Runner-up to Andy Murray in 2016 lost to Federer 6-4, 7-6 (3) in Stuttgart final on grass two weeks ago, then withdrew from second-round match at Queen's Club with right pectoral strain. NorCal connection: Never lost a set in 13 career matches in SAP Open in San Jose, winning last three titles (2011-13) before tournament was discontinued. Borna Coric (17) -- Ended Federer's grass-court winning streak at 20 matches to win Halle (Germany) last Sunday, but Wimbledon is best-of-five sets. NorCal connection: None. 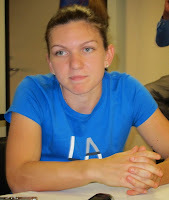 Simona Halep (1) -- After winning first Grand Slam title in French Open, withdrew from Eastbourne this week with Achilles' injury. NorCal connection: Lost in first round of 2011 Bank of the West Classic at Stanford in only San Francisco Bay Area appearance. Garbine Muguruza (3) -- Wimbledon defending champion was upset by Barbora Strycova in second round on grass in Birmingham last week. NorCal connection: Reached singles semifinals last year and quarterfinals in 2014 and won doubles title in 2014 with fellow Spaniard Carla Suarez Navarro in only two Stanford appearances. Sloane Stephens (4) -- After never playing in Grand Slam final, 25-year-old has reached two of last three, winning U.S. Open. NorCal connection: Grew up in Fresno. Lost in first round at Stanford in 2012 in only Bay Area appearance as pro. Petra Kvitova (8) -- Wimbledon champion in 2011 and 2014 won Birmingham last week, then withdrew from Eastbourne with hamstring injury. NorCal connection: Lost 6-2, 6-0 to local favorite CiCi Bellis, then 18, in Stanford quarterfinals last year in Bay Area debut. Venus Williams (9) -- Five-time Wimbledon champion (2000, 2001, 2005, 2007, 2008) and four-time runner-up (2002, 2003, 2009, 2017) has lost in first round of last two Grand Slam tournaments. NorCal connection: Eight-time Bank of the West finalist, winning in 2000 and 2002 and losing in 1998, 1999, 2004, 2005, 2009 and 2016. Made pro debut in tournament at 14 in 1994, when it was held indoors in Oakland. Serena Williams (25) -- New mother can tie Margaret Court's record of 24 Grand Slam singles titles. NorCal connection: Won Stanford in 2011, 2012 and 2014. Scheduled to play in inaugural Mubadala Silicon Valley Classic, July 30-Aug. 5 at San Jose State. Sam Querrey will be hard-pressed to match his semifinal showing last year at Wimbledon. And Sloane Stephens has a tough opener as she tries to reach the final for the third time in the last four Grand Slam tournaments. Querrey, seeded 11th, could face Kevin Anderson, seeded eighth, in the fourth round at Wimbledon for the second consecutive year and nine-time champion Roger Federer, seeded first, in the quarterfinals. Stephens, seeded and ranked fourth, will meet 54th-ranked Donna Vekic of Croatia in the first round. Vekic, 5-foot-10 (1.79 meters), won one of her two WTA titles on grass last year at Nottingham. The Wimbledon draw was held today, and play will begin on Monday. The women's and men's singles finals are scheduled for July 14-15. Querrey, a 30-year-old San Francisco native now based in Las Vegas, is 9-8 against Anderson, 32, and 0-3 against Federer, 36. Querrey won the first meeting against Anderson 6-3, 3-6, 6-3 in the opening round of the 2007 Sacramento Challenger and has lost all eight sets against Federer. The 6-foot-6 (1.98-meter) Querrey defeated the 6-foot-8 (1.98-meter) Anderson 5-7, 7-6 (5), 6-3, 6-7 (11), 6-3 in 3 hours, 7 minutes last year at Wimbledon as each player slugged 31 aces. Anderson, however, has won all three encounters since then, including a four-set battle in the quarterfinals of last year's U.S. Open en route to the final. Querrey, ranked No. 13, will open against No. 99 Jordan Thompson, a 24-year-old Australian, at Wimbledon. In their only previous meeting, Querrey triumphed 7-6 (3), 3-6, 6-3 on grass in the second round at Queen's Club in London last year. Stephens, a 25-year-old Fresno product now living in Fort Lauderdale, Fla., is 1-0 against Vekic with a 5-7, 6-2, 6-2 victory on clay in the first round at Strasbourg in 2016. Stephens could play No. 7 seed Karolina Pliskova or No. 9 Venus Williams in the quarterfinals and No. 2 Caroline Wozniacki or No. 25 Serena Williams in the semis. Stephens reached the Wimbledon quarterfinals five years ago for her best performance at the All England Club. She launched her comeback from foot surgery last year at Wimbledon, losing in the first round to compatriot Alison Riske, won the U.S. Open two months later and lost to Simona Halep in the recent French Open after leading by a set and a service break. CiCi Bellis, a 19-year-old San Francisco native who was named last year's WTA Newcomer of the Year, is out indefinitely with an arm injury. She reached the Wimbledon doubles quarterfinals last year with Marketa Vondrousova of the Czech Republic. Vondrousova turned 19 on Thursday. In other Wimbledon men's openers, San Francisco Bay Area product Mackenzie McDonald will face Ricardas Berankis of Lithuania in a matchup of diminutive players, and qualifier Bradley Klahn (Stanford, 2009-12) will meet Yuichi Sugita of Japan. Berankis and Sugita are both 5-foot-9 (1.75 meters) with 2014 victories in their only previous matches against their first-round opponents. The winner of the McDonald-Berankis match could play No. 28 seed Filip Krajinovic of Serbia in the second round and No. 3 Marin Cilic, last year's runner-up to Federer, in the third round. The Klahn-Sugita survivor likely will take on No. 21 seed Kyle Edmund of Great Britain in the second round. McDonald, 5-foot-10 (1.78 meters) and 160 pounds (73 kilograms), gained direct entry into a Grand Slam tournament for the first time. The 23-year-old former UCLA standout reached his first ATP quarterfinal two weeks ago on grass at s-Hertogenbosch, the Netherlands, and advanced to the second round of the Australian Open as a qualifier in January, losing to third-ranked Grigor Dimitrov 8-6 in the fifth set. Klahn, a 27-year-old left-hander from Poway in the San Diego area, is rebounding from his second operation for a herniated disc in his back. Ranked a career-high No. 63 in March 2014, he dropped out of the rankings in February 2016 but has fought back to No. 170. Bradley Klahn, continuing his comeback from a second back operation, will play in the main draw at Wimbledon for the first time in four years. 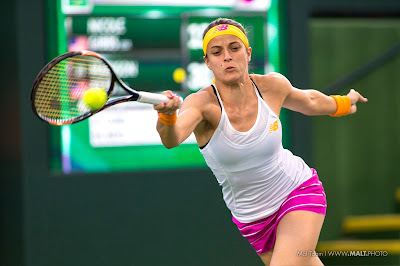 But another ex-Stanford player, Nicole Gibbs, fell short against an 18-year-old fellow Southern Californian. 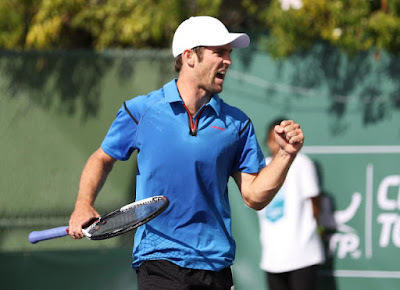 Klahn, a 27-year-old left-hander from Poway in the San Diego region, defeated Simone Bolelli, 32, of Italy 6-3, 6-4, 7-6 (3) in the final round of qualifying today at Roehampton in the London area. The 6-foot (1.83-meter) Klahn hammered 18 aces, committed only two double faults and won 77 percent of the points on his first serve (54 of 70) against Bolelli, who won the 2015 Australian Open doubles title with compatriot Fabio Fognini. Klahn's first-round opponent will be determined Friday, when the men's and women's draws are conducted. Main-draw play will begin Monday and end on July 15. In his only main-draw match at Wimbledon, Klahn lost to unseeded Sam Querrey, a San Francisco native, in four sets in 2014. Klahn underwent his second operation for a herniated disc in February 2015 and missed 21 months. Ranked a career-high No. 63 in March 2014, he dropped out of the rankings in February 2016 but has fought back to No. 170. The fifth-seeded Gibbs, 25, lost to Claire Liu 6-4, 6-3. Last year, Liu became the first American girl to win the Wimbledon junior singles title since Chanda Rubin in 1992. Gibbs, ranked No. 111, fell to 1-1 against Liu, ranked No. 238. In their first encounter, Gibbs prevailed 4-6, 6-2, 7-6 (5) in the first round of the Bank of the West Classic at Stanford last summer. Gibbs was seeking her third main-draw berth at Wimbledon. She lost in the opening round in 2015 and 2016. Fifth-seeded Nicole Gibbs (Stanford, 2011-13) beat Francesca Jones, a 17-year-old wild card from Great Britain, 6-4, 6-2 today in the first round of Wimbledon qualifying. Jones, ranked No. 547 in the world, has just a thumb and three fingers on each hand and seven toes. She was born with Ectrodactyly Ectodermal Dysplasia (EED). Gibbs, a 25-year-old American ranked No. 111, is scheduled to play Italy's Martina Trevisan, a 24-year-old Italian ranked No. 169, for the first time on Wednesday. Trevisan defeated Maryna Zanevska, a Ukraine native who plays for Belgium, 6-2, 6-3. 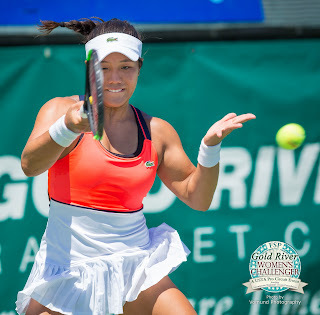 Kristie Ahn, who played with Gibbs on Stanford's 2013 NCAA championship team, outclassed Daniela Seguel of Chile 6-1, 6-3. Ahn, a 26-year-old American, will take on No. 23 seed Marta Kostyuk, a Ukrainian phenom who will turn 16 on Thursday, in their first meeting. Kostyuk reached the third round of the Australian Open in January as a qualifier. No. 20 seed Carol Zhao (Stanford 2011-14) of Canada lost to Deborah Chiesa of Italy 6-2, 5-7, 6-3. On the men's side, Bradley Klahn (Stanford, 2009-12) of Poway in the San Diego region advanced to the last round of qualifying with a 6-4, 6-1 victory over Antoine Hoang of France. Klahn, a 27-year-old left-hander ranked No. 170, will face 32-year-old Simone Bolelli of Italy for the first time on Thursday. Bolelli, ranked No. 153, eliminated Viktor Galovic of Croatia 7-6 (4), 6-3. Dennis Novikov, a 24-year-old San Jose product now living in Los Angeles, fell to countryman Christian Harrison, the younger brother of No. 58 Ryan Harrison, 7-6 (2), 4-6, 6-3. The most remarkable player at Wimbledon this year won't be Roger Federer or Serena Williams. Francesca Jones, who has just a thumb and three fingers on each hand and seven toes, is scheduled to face fifth-seeded Nicole Gibbs (Stanford, 2011-13) on Tuesday in the first round of qualifying. Jones, a 17-year-old wild card from Great Britain ranked No. 547 in the world, was born with Ectrodactyly Ectodermal Dysplasia (EED). At 9, she moved without her family to a tennis academy in Barcelona and had lived there alone for the past 6 1/2 years, The Daily Telegraph of Great Britain reported in 2016. Jones has lost count of the number of operations she has endured but said she needed three on her wrist in the 12 months before the Daily Telegraph story because a bone started to tear through a tendon. Rather than feel sorry for herself, Jones remains upbeat. "My syndrome is something that has really helped me become the person I am today," Jones told The Daily Telegraph after losing in the second round of girls singles at Wimbledon in 2016. "To a certain extent, I am happy that I have it because it has made me who I am. Hopefully it is going to help me achieve a successful future." Although her level is higher, Jones is reminiscent of former NCAA Division I players Roger Crawford and Thomas Hunt, both of whom have Northern California connections. Crawford, who has a more severe case of EED, grew up in Danville in the San Francisco Bay Area and lives in the Sacramento suburb of Granite Bay. Hunt, a New Zealander who was born without half of his left arm, played at Saint Mary's in Moraga in the Bay Area. The Jones-Gibbs match will be one of three involving a former Stanford All-American in women's qualifying on Tuesday. No. 20 seed Carol Zhao (2014-16) of Canada will meet Deborah Chiesa of Italy, and American Kristie Ahn (2011-14) will play Daniela Seguel of Chile. On the men's side, ex-Stanford star Bradley Klahn and San Jose product Dennis Novikov today reached the second round of qualifying. Klahn, a 27-year-old left-hander from Poway in the San Diego area, outclassed Ricardo Ojeda Lara of Spain 6-3, 6-2. Novikov, a 24-year-old Los Angeles resident, beat 18th-seeded Calvin Hemery of France 5-1, retired. Klahn will play Antoine Hoang of France, and Novikov will take on countryman Christian Harrison, the younger brother of 58th-ranked Ryan Harrison. SACRAMENTO, Calif. -- He's neither Spanish nor left-handed, and he doesn't have a corkscrew forehand. But Aryan Chaudhary (pronounced AH-ree-un CHOD-uh-ree) has some Rafael Nadal in him. Like Nadal, Chaudhary is tenacious. "I don't give up on any balls," Chaudhary asserted. Largely for that reason, the second-seeded Chaudhary dismantled top-seeded Eric Hadigian 6-4, 6-0 today to win the NorCal Boys 18 Junior Sectional singles title at the Natomas Racquet Club. Chaudhary, a 15-year-old resident of Santa Clara in the San Francisco Bay Area, won the last eight games. "It was pretty tough," insisted Chaudhary, adding that he has not lost a set in three matches against Hadigian (pronounced HAD-i-gun). "The guy hits the ball really deep. I just told myself I had to grind for every single ball, get every single ball back and do my best to put him under pressure. I just didn't give up on any ball. I think that worked out pretty well in the end." Another 15-year-old, Luke Casper of Santa Cruz, won the boys 16 title at Natomas. The top-seeded Casper overpowered fifth-seeded Mason Fung of San Francisco 6-2, 6-2. Hadigian, 6-foot-2 (1.88 meters) and 175 pounds (79.4 kilograms), repeatedly ripped flat groundstrokes into the corners during the final. And Chaudhary, 6 feet (1.83 meters) and 155 pounds (70.3 kilograms), repeatedly kept the ball in play until Hadigian made an error. "He's a great side-to-side mover and made me hit a lot of balls," said Hadigian, an 18-year-old Sacramentan who's headed to the University of Arizona in the fall of 2019. "Looking back, it would have been nice when he was on defense if I closed the net a little better. Yeah, his defense is great." Hadigian, ranked first in Northern California and 65th nationally in the 18s, broke serve for the only time in the match to even the first set at 4-4. But Chaudhary, ranked second in the NorCal 18s and 16s and 22nd nationally in the 16s, broke right back when Hadigian netted a low backhand. Serving for the first set, Chaudhary trailed 0-40 but won the next five points. "I just told myself, I'm going to put a couple of first serves in and make him play; I'm not going to give him any easy errors," Chaudhary, the runner-up in last year's Easter Bowl 14s, said of the pivotal game. "Then I just ended up running for every single ball. I got a couple of unforced errors from his side, took control of the game and won the set." Hadigian lamented that he was "upset with myself for being undisciplined on a couple of those points at 0-40. On the 0-40 point, I went for a return I shouldn't have. That was tough. It would have been nice to get a break there." Chaudhary, who did not lose a set in six tournament matches, recorded his second service break of the second set to lead 3-0 on a point that typified the match. After he made a series of great gets, Hadigian slugged an overhead wide. On Chaudhary's first match point, Hadigian mis-hit a forehand that struck the opposite fence. "I was a little frustated with how I was playing (in the second set) and some of the errors I was making, but I gave it my all," Hadigian said. "He was playing too well and lifted his game as well, so this is a tough situation." Attending the match were Arizona coach Clancy Shields and his brother, Fresno State coach Luke Shields. Chaudhary, who will be a junior at Archbishop Mitty High School in San Jose, eventually could face Hadigian, a senior who takes online classes, in the Pacific-12 Conference. "If I could get in, I would love to go to Stanford," Chaudhary said of the university located only 20 miles (32 kilometers) northwest of Santa Clara. "That's always been my dream." Casper, playing aggressively, won the last four games of each set against Fung. "It seemed to work when I hit extremely hard and moved him around," said Casper, ranked fourth in NorCal and 72nd nationally in the 16s. "Then he gave me weak balls to put away." Whereas Casper did not lose more than three games in a set in his six tournament matches, Fung survived long three-set battles in the third round and quarterfinals. He overcame a 2-5 deficit in the third set and saved three match points in a 5-7, 7-5, 7-6 (8) victory over third-seeded Hugo Hashimoto of San Jose in the quarters. Fung, ranked 10th in NorCal and 224th nationally in the 16s, said those marathons took a toll on him in the final but weren't "the main factor. He just played really well." Casper, who will be a sophomore at Bellarmine College Preparatory in San Jose, is the fourth of seven children. The oldest, Caroline, represented the family at today's final. Caroline reached the NCAA Division III semifinals as a sophomore at Pomona College last year and the NCAA quarterfinals this year. Their father, a lawyer named Mark, played tennis at Santa Clara University. Fung, 16, will be a senior at St. Ignatius College Preparatory in San Francisco. He said he has not received any college scholarship offers and is looking at schools. Fung's brother Jayson plays at D-III Amherst in Massachusetts, but Mason said he could stay near home and play for one of his two coaches, Pablo Pires De Almeida, at the University of San Francisco or at Santa Clara. Eric Hadigian (1), Sacramento, def. Andrei Volgin (4), Fremont, 6-0, 7-5. Aryan Chaudhary (2), Santa Clara, def. Daniel Baturyn (3), San Leandro, 6-4, 6-2. Chaudhary def. Hadigian, 6-4, 6-0. James Bell, Fremont, and Aryan Chaudhary (5), Santa Clara, def. Zachery Lim, Fairfield, and Daniel Papacica (1), Carmel, 7-5, 3-6 [10-7]. Luke Casper (1), Santa Cruz, def. Philip Martin (9), Los Altos, 6-1, 6-2. Mason Fung (5), San Francisco, def. Theodore Dean (2), Livermore, 6-4, 6-1. Casper def. Fung, 6-2, 6-2. Theodore Dean, Livermore, and Joseph Teh (4), San Jose, def. Luke Casper, Santa Cruz, and Philip Martin (2), Los Altos, 1-6, 6-1 [10-5]. Anna Campana (3), Hillsborough, def. Muskan Mahajan, San Ramon, 6-4, 6-1. Anna Campana, Hillsborough, and Jennamarie Gordon (1), Saratoga, def. Klara Kosan, Carmichael, and Jozephine Yen, Los Altos, walkover. Katherine Duong, Cupertino, and Stephanie Nguyen (2), Fremont, def. Taylor Gould, Los Altos, and Anna Yu, Palo Alto, walkover. Duong and Nguyen (2) def. Campana and Gordon, 6-3, 7-5. Allura Zamarripa (2), Saint Helena, def. Tomi Main (1), Seaside, 6-4, 7-6 (0). Allura Zamarripa and Maribella Zamarripa (1), Saint Helena, def. Mirabelle Brettkelly and Claire Galerkin, San Francisco, walkover. Tomi Main, Seaside, and Makenna Thiel (2), Piedmont, def. Madison Weekley, Alamo, and Sophia Zaprianov, Concord, 6-2, 6-1. Zamarripa and Zamarripa (1) def. Main and Thiel (2), 6-0, 6-2. Nicholas Chen (1), Oakland, def. Luke Bollinger (9), Napa, 6-1, 6-2. Dylan Tsoi (3), El Dorado Hills, def. Ryan Hoang (5), San Rafael, 6-3, 6-4. Rhea Rai (1), Cupertino, def. Emily Novikov (5), Campbell, 6-3, 6-3. Gayathri Krishnan (5), Cupertino, def. Emily Zhao (2), Cupertino, 6-3, 6-2. Maryia Hrynashka (1), Rancho Cordova, and Lauren Joyce (1), Lodi, def. Gayathri Krishnan, Cupertino, and Kamila Wong, Palo Alto, 6-2, 7-5. Ava Martin, Menlo Park, and Natasha Rajaram (4), Cupertino, def. Sofia Daryaie, Los Gatos, and Emma Pell (2), San Rafael, 6-3, 4-6 [18-16]. Kosei Ogata (1), Saratoga, def. Sterling Davies (3), El Dorado Hills, 6-3, 6-2. Min Htun (5), Sacramento, def. Karthikeya Gannavarapu (4), Pleasanton, 6-3, 6-3. Nav Dayal, Roseville, and Karthikeya Gannavarapu (1), Pleasanton, def. Arnav Bhandari, San Ramon, and Jack Satterfield (5), Lafayette, 8-6. Ted Nguyen, Elk Grove, and Daniel Wu (3), El Dorado Hills, def. Ajay Ravichandran, Union City, and Elbert Said (5), San Ramon, 8-4. Kosei Ogata and Somei Ogata (5), Saratoga, def. Arin Pallegar, Granite Bay, and Tej Patil (4), San Jose, 8-6. Min Htun, Sacramento, and Luke Stratakos (2), Saratoga, def. Dhyey Patel, Napa, and Aryan Yenni (5), Fremont, 8-6. Aspen Schuman (1), Menlo Park, def. Clarissa Sutami (9), Folsom, 6-2, 6-2. Penelope Wong (9), Mountain View, def. Aoi Kunimoto (2), Palo Alto, 3-6, 6-3, 6-1. Anushka Jaiswal, Fremont, and Aspen Schuman (1), Menlo Park, def. Clarissa Sutami, Folsom, and Penelope Wong, Mountain View, 7-5, 6-3. Varsha Jawadi, San Mateo, and Mila Mulready, Burlingame, def. Rachel Hernandez and Sophie Hernandez (2), Los Gatos, 7-5, 6-1. Eric Hadigian and Zachery Lim know each other well. The players from the JMG Tennis Academy in Sacramento met today in the quarterfinals of the NorCal Boys 18 & 16 Junior Sectional Championships. The top-seeded Hadigian beat the fifth-seeded Lim 2-6, 6-2, 6-1 at the Natomas Racquet Club in Sacramento. Hadigian, a rising senior who has verbally committed to Arizona, is scheduled to face No. 4 Andrei Volgin of Fremont on Sunday at 10 a.m. Volgin outlasted unseeded Sam Gibson of Chico 6-2, 6-7 (5), 6-4. In the other semifinal at 10 a.m., No. 2 seed Aryan Chaudhary of Santa Clara will meet No. 3 Daniel Baturyn of San Leandro. The final is set for 2 p.m.
Eric Hadigian (1), Sacramento, vs. Andrei Volgin (4), Fremont, 10 a.m.
Aryan Chaudhary (2), Santa Clara, vs. Daniel Baturyn (3), San Leandro, 10 a.m.
Zachery Lim, Fairfield, and Daniel Papacica (1), Carmel, vs. James Bell, Fremont, and Aryan Chaudhary (5), Santa Clara, 5 p.m.
Luke Casper (1), Santa Cruz, vs. Philip Martin (9), Los Altos, 8 a.m.
Theodore Dean (2), Livermore, vs. Mason Fung (5), San Francisco, 9 a.m.
Luke Casper, Santa Cruz, and Philip Martin (2), Los Altos, vs. Theodore Dean, Livermore, and Joseph Teh (4), San Jose, 3:30 p.m.
Anna Campana (3), Hillsborough, vs. Muskan Mahajan, San Ramon, 8 a.m.
Anna Campana, Hillsborough, and Jennamarie Gordon (1), Saratoga, vs. Klara Kosan, Carmichael, and Jozephine Yen, Los Altos, 11 a.m.
Katherine Duong, Cupertino, and Stephanie Nguyen (2), Fremont, vs. Taylor Gould, Los Altos, and Anna Yu, Palo Alto, 11 a.m.
Tomi Main (1), Seaside, vs. Allura Zamarripa (2), Saint Helena, 8 a.m.
Allura Zamarripa and Maribella Zamarripa (1), Saint Helena, vs. Mirabelle Brettkelly and Claire Galerkin, San Francisco, 1 p.m.
Tomi Main, Seaside, and Makenna Thiel (2), Piedmont, vs. Madison Weekley, Alamo, and Sophia Zaprianov, Concord, 1 p.m.
Nicholas Chen (1), Oakland, vs. Luke Bollinger (9), Napa, 12:30 p.m.
Dylan Tsoi (3), El Dorado Hills, vs. Ryan Hoang (5), San Rafael, 12:30 p.m.
Rhea Rai (1), Cupertino, vs. Emily Novikov (5), Campbell, 11:30 a.m.
Emily Zhao (2), Cupertino, vs. Gayathri Krishnan (5), Cupertino, 11:30 a.m.
Maryia Hrynashka (1), Rancho Cordova, and Lauren Joyce (1), Lodi, vs. Gayathri Krishnan, Cupertino, and Kamila Wong, Palo Alto, 3:30 p.m.
Sofia Daryaie, Los Gatos, and Emma Pell (2), San Rafael, vs. Ava Martin, Menlo Park, and Natasha Rajaram (4), Cupertino, 3:30 p.m.
Kosei Ogata (1), Saratoga, vs. Sterling Davies (3), El Dorado Hills, 9 a.m.
Karthikeya Gannavarapu (4), Pleasanton, vs. Min Htun (5), Sacramento, 9 a.m.
Nav Dayal, Roseville, and Karthikeya Gannavarapu (1), Pleasanton, vs. Arnav Bhandari, San Ramon, and Jack Satterfield (5), Lafayette, 1:30 p.m.
Ted Nguyen, Elk Grove, and Daniel Wu (3), El Dorado Hills, vs. Ajay Ravichandran, Union City, and Elbert Said (5), San Ramon, 1:30 p.m.
Kosei Ogata and Somei Ogata (5), Saratoga, vs. Arin Pallegar, Granite Bay, and Tej Patil (4), San Jose, 1:30 p.m.
Min Htun, Sacramento, and Luke Stratakos (2), Saratoga, vs. Dhyey Patel, Napa, and Aryan Yenni (5), Fremont, 1:30 p.m.
Aspen Schuman (1), Menlo Park, vs. Clarissa Sutami (9), Folsom, 9 a.m.
Aoi Kunimoto (2), Palo Alto, vs. Penelope Wong (9), Mountain View, 9 a.m.
Anushka Jaiswal, Fremont, and Aspen Schuman (1), Menlo Park, vs. Clarissa Sutami, Folsom, and Penelope Wong, Mountain View, 1:30 p.m.
Rachel Hernandez and Sophie Hernandez (2), Los Gatos, vs. Varsha Jawadi, San Mateo, and Mila Mulready, Burlingame, 1:30 p.m.
SACRAMENTO, Calif. -- Five years ago, California's capital had several marquee tennis events. The 27th-largest metropolitan area in the country with a population of 2.3 million, Sacramento offered the Capitals of World TeamTennis, a $100,000 men's Challenger, a $50,000 women's Challenger, the Big Sky Conference championships and the USTA National 30 Indoor Championships. Now they're all gone. Sacramento also lost a four-man legends tournament featuring Pete Sampras, John McEnroe, Jim Courier and James Blake after only one year in 2014. 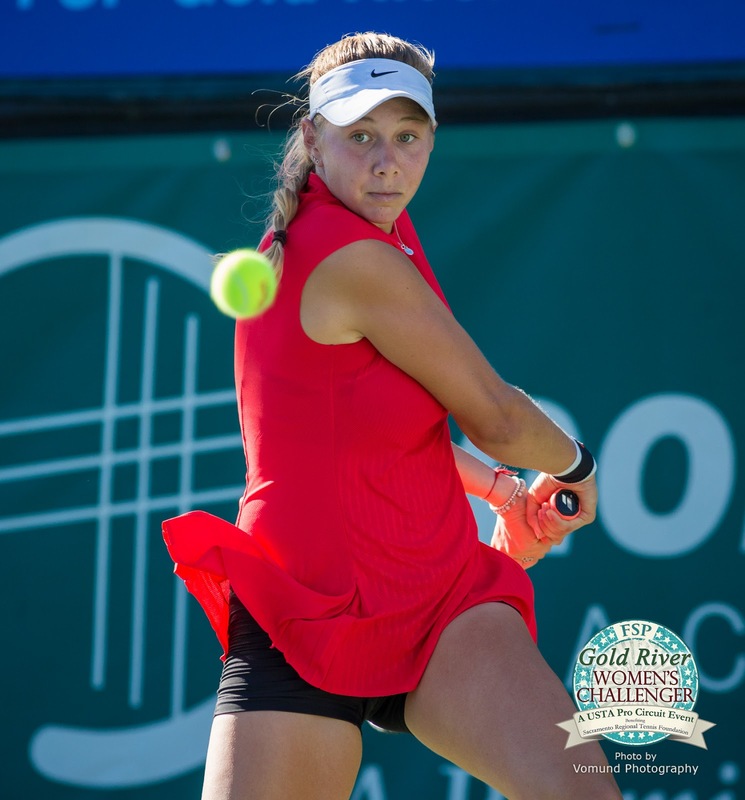 The $60,000 FSP Gold River Women's Challenger, the latest big event to leave Sacramento, ended a six-year run last summer. "Sacramento has a lot of companies, but they have their decision-making outside of the area. We're competing with the Kings (of the NBA), the River Cats (the San Francisco Giants' Triple-A affiliate) and the Republic (of the United Soccer League). Unfortunately, these (tennis) events don't attract a lot of people, so it's hard to get sponsorship." Lielani Steers, the CEO of the shipping company based in the Sacramento suburb of Rancho Cordova, did not return a phone call for comment. Winning singles titles in the Gold River Women's Challenger were, in order, Modesto product Maria Sanchez, Mayo Hibi of Japan, Olivia Rogowska of Australia, Anhelina Kalenina of Ukraine, Sofia Kenin of Pembroke Pines, Fla., and Amanda Anisimova of Aventura, Fla. Hibi (17), Kenin (17) and Anisimova (15) were teenagers at the time. Fortunately for Northern California fans, the tournament will be replaced by the $60,000 Berkeley Tennis Club Challenge, July 16-22. Past members of the Berkeley Tennis Club, founded in 1906, include International Tennis Hall of Famers Don Budge, Helen Wills Moody, Helen Jacobs and Hazel Wightman. "The USTA is giving (the Berkeley tournament more) money, and it's on the cheap," said Burchett, who would not divulge figures. "They don't have to put up shade, which is some savings." Heat could be a factor in the move. Summer temperatures in Berkeley in the San Francisco Bay Area are about 20 degrees Fahrenheit (11 degrees Celsius) cooler than in Sacramento in the scorching San Joaquin Valley. USTA coordinator Milagros Sequera also did not return a phone call. Technically, Berkeley will replace Stockton during the week of July 16, and a new $60,000 women's tournament in Ashland, Ky., will replace Sacramento. The $60,000 Stockton women's Challenger will be held concurrently with the $100,000 Stockton men's Challenger on Oct. 1-7. Singles qualifying for the Berkeley Tennis Club Challenge will begin on Sunday, July 15, at noon, and the singles main draw will start on Tuesday, July 17, at noon. The doubles and singles finals are scheduled for Saturday, July 21, and Sunday, July 22, respectively, at times to be determined. Jenson Brooksby, a 17-year-old qualifier from Carmichael in the Sacramento area, knocked off second-seeded Emilio Gomez of Ecuador 6-1, 6-2 today in the first round of the Sargent & Collins, LLP Men's $25,000 Futures in Buffalo, N.Y.
Gomez, at No. 525, is the fourth-highest-ranked player Brooksby has defeated. Last year, he beat No. 420 Takanyi Garanganga, No. 427 Garanganga and No. 457 Benjamin Lock. Both Garanganga and Lock are from Zimbabwe. Gomez, the 26-year-old son of 1990 French Open champion Andres Gomez, reached a career-high No. 215 in 2014. Brooksby, who has verbally committed to attend Texas Christian, is scheduled to meet No. 860 Markos Kalovelonis on Thursday at 8 a.m. PDT. Kalovelonis, a 24-year-old native of Greece who plays for Russia, outclassed Collin Johns, from Columbus, Ohio, 6-4, 6-3. Brooksby lost in the first round of doubles with Alexander Knight, 5-7, 7-5 [11-9] to Patrick Daciek and Maksim Tikhomirov in an all-American encounter. Maybe it should be called the Comeback Classic. Victoria Azarenka plans to join Serena Williams and Maria Sharapova in the inaugural Mubadala Silicon Valley Classic this summer at San Jose State, tournament officials announced today. All three players have been ranked No. 1 in the world. But for various off-court reasons, Azarenka has fallen to No. 86, Williams to No. 183 and Sharapova to No. 23. Because of pregnancy, the birth of her first child and a subsequent custody battle, Azarenka played in only two tournaments from June 2016 through February this year. She reached the semifinals of the Miami Open in April, losing to eventual champion Sloane Stephens, but lost in the first round of the French Open to eventual doubles champion Katerina Siniakova of the Czech Republic. Sept. 1, has played in only three tournaments this year. She withdrew from her fourth-round match against Sharapova in the French Open with a chest muscle injury, but her coach, Patrick Mouratoglou, said she should be ready for Wimbledon (July 2-15). Sharapova returned from a 15-month doping suspension in April last year. She had a strong clay-court season, advancing to the quarterfinals in Madrid, the semifinals in Rome and the quarterfinals of the French Open. Also entered in the Silicon Valley Classic, July 30-Aug. 5, are Madison Keys and CoCo Vandeweghe, the champion and runner-up, respectively, in last year's Bank of the West Classic. The tournament is moving to San Jose with a new sponsor after 21 years at Stanford. The full field will be announced on June 19. 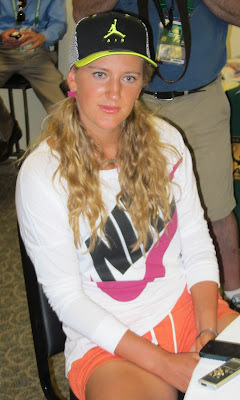 Azarenka, 28, of Belarus will make her fifth appearance in the San Francisco Bay Area and first since 2014. She withdrew from last year's Bank of the West Classic with a viral illness. In addition to beating Sharapova for the 2010 singles title at Stanford, Azarenka won the 2011 doubles crown with Maria Kirilenko of Russia. Azarenka has won 20 career singles titles, including the Australian Open in 2012 and 2013. She spent 51 weeks at No. 1 in 2012 and 2013 sandwiched around Sharapova's fifth stint at the top, a four-week stay. To purchase tickets to the Mubadala Silicon Valley Classic, visit MubadalaSVC.com or call (866) 982-8497.